Howard Hawks’ Red River (1948) presents a patriarchal society where men live by a macho, male code that excludes women and explores the notion of what it is to be a man and how violence aids in this definition. There is also a lack of women in this male-dominated world, which leads to the forming of male friendships that contain the subtext of homoeroticism. Red River consists of an on-going battle between the old, nostalgic male-dominated world, embodied by Thomas Dunson (Wayne), versus a more progressive world, as represented by Matthew Garth (Clift), that combines the old world values with compassion. Hawks’ film also uses violence and the notion of professionalism as a male refuge. Dunson is a self-made man who strikes out on his own to start a cattle ranch known as the Red River in Texas with loyal friend Cookie (Brennan) and a young boy named Matt who survived an Indian attack. Ten years pass and Dunson cultivates enough cattle to sell them for a lot of money in Missouri. So, Dunson, Cookie and a grown-up Matt make the perilous journey that sees them facing Indians, bad weather and internal strife – the latter of which may be the greatest danger as Dunson becomes a hard, twisted version of his former self. Red River is quick to establish the male code of what it is like to be a real man. Before Dunson starts the cattle drive he talks to all of his ranch hands and explains the rules that will govern the drive when he states that “Every man who signs on for this drive agrees to finish it. There’ll be no quitting along the way. Not by me and not by you.” Dunson is shot by himself in this scene. Only he has the power to establish the rules because he is the authority figure of this male group. Once the men sign on for the drive, they must live by Dunson’s professional code of conduct. From the start of the film, Red River establishes a male-dominated world devoid of women. Dunson and Cookie, his loyal friend, decide to leave the settlers and stake out their own claim on the frontier. His love interest appears and, despite her protest to the contrary, he excludes her from his world because the frontier is, as he puts it, “too much for a woman.” She cannot go with him to tame the frontier because that does not fit into his old world values where men explore and women stay home. He is a man set in his beliefs as Pop explains to the settlers, “He’s a might kept man when his mind is made up. Even you can’t change him.” Dunson is clearly a man of old-fashioned sensibilities who stays fixed in his ways, refusing to change for no one, even for the woman he loves. These old world values only strengthen when he learns of her death. Dunson becomes cold and dead inside. Everything he loved is gone with her passing and he refuses to let his guard down for anyone. To fill this void, Dunson creates a male friendship with the only surviving member of the settlers: a little boy named Matt. Dunson meets Matt and after a manly display in which the boy threatens him with gun to which he slaps out of his hand, does Dunson decide that, “He’ll do.” Matt has been accepted into the fold. He is now part of the male-driven world. To show compassion or emotion is to show weakness in Red River. Those who reveal a more feminine side are punished. During the cattle drive, Dan, one of the cowboys, tells Dunson and Matt his dreams of the future. With the money he will earn from the cattle drive, he plans to buy a house and a pair of red shoes that his wife always wanted. It is an emotional moment that reveals a domesticated way of life that goes against Dunson’s frontier vision. This opposition is destroyed when Dan is consequently killed in the stampede. Dan is killed because he does not belong in Dunson’s world. He yearns for a more docile lifestyle. However, Dunson does show some emotion when he learns of Dan’s death. He tells Matt to give the money that Dan would have earned to his wife and, although he does not come right out and say it, to use some of the money to buy her a pair of red shoes. This is a brief glimpse of Dunson’s compassionate side, but it quickly disappears when he finds out who caused the stampede. Matt represents the new version of what it is to be a man. He can be compassionate and still be a man. He can be kind, but he is not afraid stand up for his beliefs. It is this kindness that the men respect, while they fear Dunson’s rigid work ethic, which results in Matt taking over as leader of the cattle drive when the elder man goes over the edge. This is a symbolic passing of the old world into the new. Dunson’s values are no longer valid with the current times and so Matt must take his place with a modern version of manliness. Despite the dual nature of Matt in Hawks’ film, and the admission that he and Dunson “love each other,” as one character observes, Red River ultimately fulfills the notion that violence and professionalism are a male refuge. Dunson finally changes his brand so that it will have Matt’s initial on it as well. Dunson draws the new brand into the ground and says to Matt, “You’ve earned it.” Hawks cuts to a shot of the new brand and the film ends. This symbolic passing of the male mantle of power from Dunson to Matt undermines the progressive nature of his character. All of Matt’s actions are undermined in this moment when he symbolically becomes a man with Dunson’s blessing. Red River upholds the conventions of male genres. Painstaking work has obviously gone into this Blu-Ray transfer with most blemishes removed so that Red River looks as good as it ever has with a nice filmic texture. Included is the theatrical version, which Howard Hawks prefers, and for fans of the film, the longer, pre-release cut, which contains extra shots and dialogue as well as a prologue scroll. “Bogdanovich on Red River” features director Peter Bogdanovich talking about Hawks and the film. 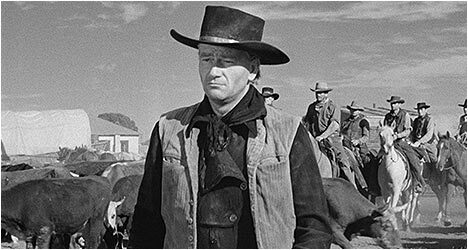 He discusses how John Wayne plays a darker character for the first time, maybe the darkest in his career. He praises Montgomery Clift’s performance and points out the differences between the two versions. “Hawks and Bogdanovich” features excerpts from an April 1972 audio interview with Hawks by Bogdanovich. The veteran director reminisces about the making of Red River and recounts several entertaining filming anecdotes. Hawks also talks about the two versions and his distaste for the pre-release one. Also included is a trailer. Film critic Molly Haskell is interviewed and she talks about the role gender plays in Red River. She also examines several themes that run through the film in an informative way. There is an interview with scholar Lee Clark Mitchell who examines the film in relation to the western genre and its iconography. He also examines the life and career of Borden Chase and his novel, Blazing Guns on the Chisholm Trail, which the film is based on. Also included are audio excerpts from a 1969 interview with author Borden Chase who talks about his views on Hawks’ film. He wasn’t big on collaboration and offers his impressions on Hawks. Finally, there is “Lux Radio Theatre,” a March 7, 1949 broadcast of an adaptation of Red River with John Wayne, Walter Brennan and Joanne Dru reprising their roles. In a nice touch, a copy of Chase’s previously out-of-print novel on which the film is based on, is included.